France is one of the most visited countries in the world--and one of the least known. This book takes you beyond the superficial coverage of conventional guidebooks--history, architecture, etc.--in search of the deeper truths. Nick Inman is a writer, a photographer, and a translator. He is the author, coauthor, and editor of more than 30 books, including Eyewitness Spain, The Optimist's Handbook, and the Road Less Traveled: Amazing Places Off the Tourist Trail. "For all those millions who love France for more than just sunny days and great food, Mystical France is the complete guide to help the spiritual in you the next time you visit this wonderful country.The author, Nick Inman, has lived in France for years and raised his children there and he knows France. His guide to the secrets, mysteries and sacred sites of mystical France tells us all we need to know in order to enjoy, participate, and understand this rich spiritual heritage. Mystical France is well researched with fascinating stories of places and people. Topics covered range from the value of legends in our lives to Templar sites and the Chateaux of the Alchemists to churches and faiths in France today. Inman takes the time to explain French spiritual history and beliefs in an easy- to- read way. Author of many best-selling guide books to France and Spain, he gives us in this new book the added plus of a skilled guided tour of some of the best and most interesting places to visit from soaring cathedrals like Chartes to pilgrim routes such as St. Jacques de Compostela. This is the best and most concise guide to spiritual and mystical France that you are ever likely to need. Highly recommended." "A gem of a guide of high worth. The beauty of writing a book on mystery and legend is that we are not fettered by history or convention, and the joy of reading such a guide is that we are free to interpret as we see fit. Nick Inman directs us to ancient sites and leaves us there to explore and decipher the unknown. The chapter Seeing Beyond provides a wonderful introduction to looking behind the obvious. The tourist looks for a stone altar while the pilgrim seeks an altered state. The one looks for information the other insight. Photographs relieve the text and provide the feel of a travel guide, which makes it easy to dip in and out of the various chapters. As a cartographer I would like to have had maps to help me locate the many sacred sites that the author refers to. But overall this is a welcome addition to the paucity of material available to the mysteries that lie behind and within the manifold monuments of France. Bravo. Now let’s have one to Mystical Spain." "Nick Inman's beautiful photographs and descriptions of the sacred spots and beautiful architecture, people and legendary sights in France including Carnac, Mont-Saint, Michel, Notre Dame, Chartres and others make you want to take the first plane to that magical historic land. Nick's understanding of esoteric and spiritual matters is subtly expressed throughout this travel guide so you may learn as do all travelers in their wisdom, that there are two aspects to the journey: There is the destination and the experience of getting there! In learning to see the world and the historic events that took place in these unprecedented places of antiquity, we learn more about our self, the world and universe and connect to our deepest memories of creation and love. READ THIS BOOK to discover all that you may have not known about France and to understand the deeper inner workings of your Being and the metaphysical view of life death and energy evolving through time, space and life as we continue to improve the human condition." 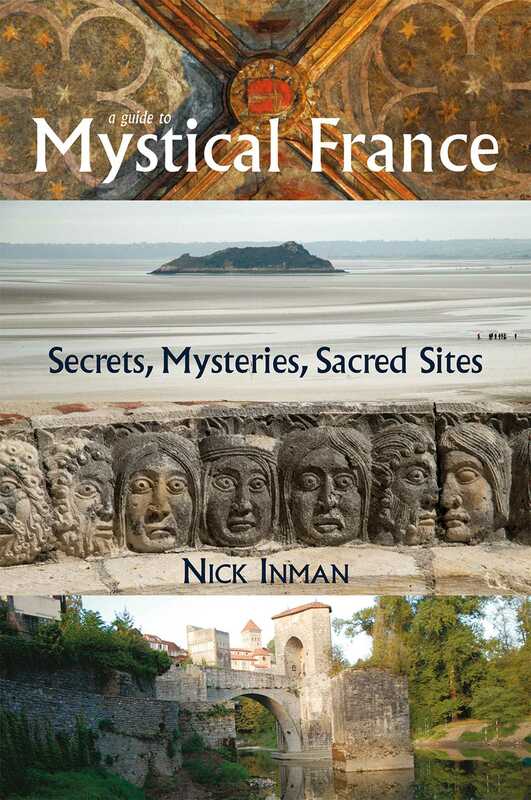 "Nick Inman’s beautiful book about ‘Mystical France -- Secrets, Mysteries, Ancient Sites’ is an exciting and useful addition to any travel library. And it is a volume particularly pleasing to me given our recent purchase of a lovely 17th Century Manoir in South West France, a house and land which are also steeped in secrets and mystery to be unravelled. A well-known and accomplished travel writer who lives in France with his family, Nick has explored the country with a keen eye and intellect, evidenced by the comprehensive coverage of many sites -- and sights -- not on the regular tourist route. He offers historical fact, well-researched details of little-known places and their significance, and 240 lavish photographs to illustrate them. This is an excellent guide to a subtle and rewarding France beyond wine, sunshine, food and fashion, with secrets many visitors don’t know about, and if you are planning a visit or even just passing through, you will discover a wealth of fascinating places of interest. The book is versatile and lends itself both to planning an itinerary of sites that intrigue you, and to dipping in and learning about a wide range of fascinating topics from labyrinths and stained glass, angels and fairies, King Arthur in France, pilgrimage routes, little known caves and their paintings, the Tarot and the Templars and much more – some 60 individual features and 14 standalone chapters. Highly recommended for anyone interested in the hidden beauty of this vast and enticing country. And -- as I mentioned to Nick when his book arrived, it’s a multi-sensory experience too, not only rich in colour with heavyweight paper, but it has that delicious (to me) smell of a good covering of ink!" "A Guide to Mystical France takes you deep under the psychic skin of France into the invisible dimensions that our materialistic world does its best to ignore. Science stops at the most interesting questions. To describe, say a painted prehistoric cave as a sacred space used for ritual is to beg more questions than it answers. It is impossible to fully appreciate the cathedral of Notre-Dame, Mont St Michel, or the alignments of Carnac if you do not understand the reasons these structures were built, and the way they have been used over the centuries. The book makes no assumptions. The reader is not required to believe anything. He is merely pointed in the direction of the invisible and the hidden and left to judge for himself. You get much more out of a visit if you look for what isn’t there as well as what is. The travel guide section at the end provides region-by-region suggestions of where to go to discover Mystical France yourself." "Although in one sense this splendidly produced and abundantly illustrated book could be classified as an alternative travel guide, it is considerably more than that. Although probably best known for its food and wine, France is of course the birth place of various strands of belief both conventional and heretical and the has left its mark on the country in a myriad of ways. The Book, which is an absolute joy to read and has production values that are second to none, is packed full of fascinating information on a range of mystical and truly magical subjects. Everything from the Knights Templar and the Cathars to imposing structures like the cathedrals of Notre Dame and Chartes and the ancient enigmatic megaliths at Carnac as well, are discussed here. Along with these we find the legends surrounding Mary Magdalene and Nostradamus, Fulcanelli and alchemy and especially the ongoing mystery of Rennes le Chateau and what did or did not happen there. It even has a travel guide section to help you create your own travel itinerary. One particular enjoyable facet of the book is the fact that the reader can literally dip in anywhere and be sure to unearth a nugget of information. If one is considering a visit to France then this book would make an invaluable guide to places seldom encountered on the tourist trail."